I knew Dinas Bran would be involved so extended the compass point out from the peak to touch Dinas Bran and rotated the compass to see it pass through Valle Crucis abbey and the pillar just to the N/W of the abbey. This circle also passed through two springs, a reservoir, two Cairns and another major hill which sat on the junction crossover of the 51.51 triangle with the circle. I then connected the spot height of Eglwyseg mountain with a line to Dinas Bran castle , and a line to the Abbey……..This made a 36 degree angle, the first sign of Pentagonal geometry. Splitting this angle into two 18 degree sections gave me the initial main pentagonal axis which was confirmed as the rest of the geometry unravelled. Drawing in this first main axis saw the line pass through Geraint hill on the opposite side of the river Dee and onto another major hill to the south called Y - Foel, through a church, then a major hill, through Cerrig Wwynion fort and onto another peak. At the far North of the axis the line hit the peak of Esclusham Mountain spot height 480. All grids discovered to date have lines of symmetry in abundance, the Architect loves to mirror its creations in a ‘as above, so below’ arrangement which is one interpretation of the two interlocked triangles so prevalent in grid mechanics. From the initial circle centred on Eglwyseg Mountain I drew in the E/W axis at ninety degrees to the main N/S axis. 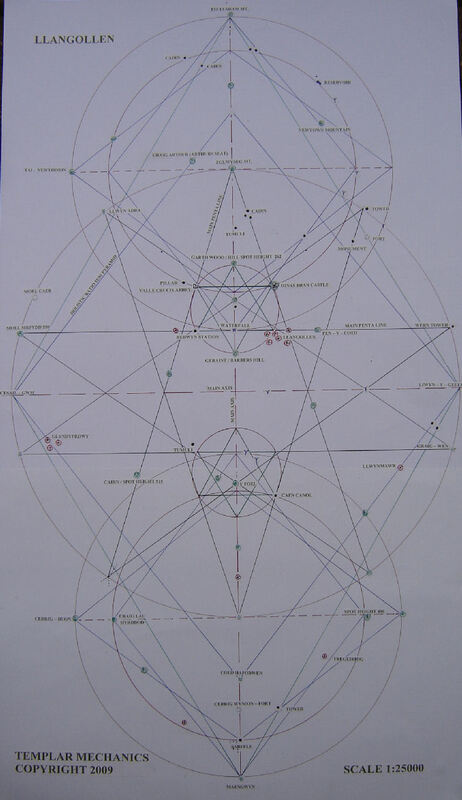 From this line I drew in the 51.51 triangle which then at the triangle peak automatically revealed the point as the relative outer circle giving sacred Earth / Moon holistic ratios…….when I drew this second circle in it went through Esclusham Mountain on the main North / South axis. When I glanced again at Dinas Bran and the Abbey it looked organised so connected them with a line. Noting the distance I looked for features within the spin field of the distance measure. The compass showed Geraint Hill to be spaced this distance from both the Abbey and the Castle and also situated on the main axis…..here then was a perfect equilateral triangle arrangement created by hill –hill / abbey – hill / castle. If a full six pointed seal was to be found all I had to do was invert the triangle…..this then created the other half of the seal made up of Llangollen church, Berwyn station and Garth wood hill with a spot height of 262 which fell perfectly on the north side of the main axis …..My attention then fell on the small hill that was also placed on the main axis between Garth Hill and the opposing Geraint hill …….I knew it would also be involved at some level …..This I felt would be shown later at the relevant time. Berwyn station for its high human traffic quota is a relevant point within the mechanics. In Bristol Temple Meads station is built on the old Knights Templar settlement for the same reason………another example suggesting the Templar’s were aware of Earth energy grids …..It also shows how grid manifestations change over time …yet still have a function. The links I will be posting on the Llangollen section will detail the Templar connections within this seal area. One article mentions that the Castle and Abbey were built under the same patronage linked to the Cistercian order, as we know the Cistercians were behind the creation of the Templars. The Templar graves discovered locally also suggest a Templar presence at specific points in the seal geometry…..another article mentions Templar stones were found at Llangollen bridge during a reconstruction…..If it’s the bridge marked on the 1:25000 near the church at Langollen that would be 3 points of the seal linking with the Templars. Now having connected all the seal lines with the relative points I looked deeper to find the rest of the pentacle arms and ultimately the circle that would enclose them. My attention once again returned to the seal and noticed if I extended the seal line joining Berwyn station to the Bridge/Llangollen church it went through a further two churches East and West of the seal boundary…..What really grabbed me was the Main feature of Moel Mrfydd Mountain with a spot height of 550. I measured the distance from the main axis to the mountain and then checked for features the same distance in the opposite direction on the same seal line……..This then brought in Wern Tower as the other penta arm point in the East. Taking 36 degree angles off the arms meant the base legs hit another major hill and a meeting of trackways…completing the penta. Cesail – Gwm and Llwyn – y – Gelli became points at the opposite end of the main east /west axis that determined the large penta circle. Mirroring the penta meant the ‘upside down penta’ legs crossed at the crotch point on the hill within the seal mentioned above …completeing that seal area……….when I looked at the southern crotch point of the penta the lines crossed at Y Foel peak….showing a mirror was indeed imprinted in the design. I then replicated the seal found in the north section to see a Natural spring, Cafn Canol falling in with the geometry as well as Y Foel. On the north seal I measured the break / angle at the penta leg crossing ….This was 108 degrees……perfect pentagonal dynamics. The arms measured between 35.5 and 36 degrees. One church on the initial penta shoulder line that joins ….Moel Mountian, Berwyn station, Langollen church , Peny- co- ed and Wern tower,…. is situated on the meeting of two main penta lines. One of these penta lines links Dinas Bran Castle back to the original peak of Elwyseg mountain…..this cross over point of penta lines where the church is situated marks the golden ratio division/section of the pentacle arm so is of special interest to me. The positioning of the seals for both the north and south pentacles appear at the throat and crotch position. Each six pointed seal has a double use in this respect. Temple Bruer has the six pointed seal at the end of the Penta leg/arm. More graphics will be uploaded as more geometry is discovered within the established grid scaffolding …….There is more magic to be found in the landscape surrounding Llangollen.